You have plenty of time to plan the holiday meals, but with the temps beginning to lower and gray skies isn’t it a comforting thought to think about them!? Just the idea of a fire in the fireplace surrounded by loved ones has me excited about the promises held in he covers of food publications with cover stories on pumpkin cakes and buttermilk biscuits. 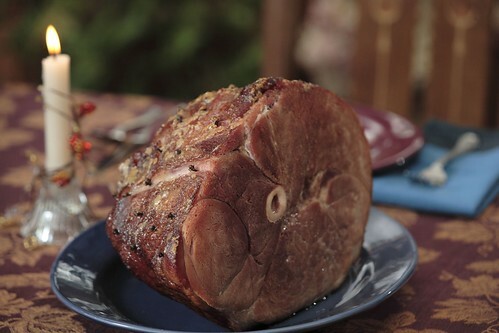 As an alternative for Thanksgiving or as the star of your Christmas dinner this recipe for a Maple Glazed Ham is a classic. A simple protein rich dish with fantastic flavor, perfect for your holiday table. Your guests will be delightfully satisfied and so then should you. Preheat oven to 350 F. Trim fat, leaving a 1/4 inch layer. Using the tip of a sharp knife, score the fat in a diamond pattern. Insert the cloves in the crossed point of each diamond. Mix mustard and syrup together in small bowl. Pour syrup mixture onto ham and spread. Pour syrup mixture onto ham and spread evenly. Bake for 1 1/2 hours, or 10 minutes per pound.